Actually, my mum does still use plastic bags. And she doesn’t compost. Sigh. How does the saying go?…grant me the serenity to accept the things I cannot change, the courage to change the things I can, yadda yadda yadda. I’m working on it. The great news is, there are some things I can change. And one of them is the culture of single-use plastic bags at my local supermarket! 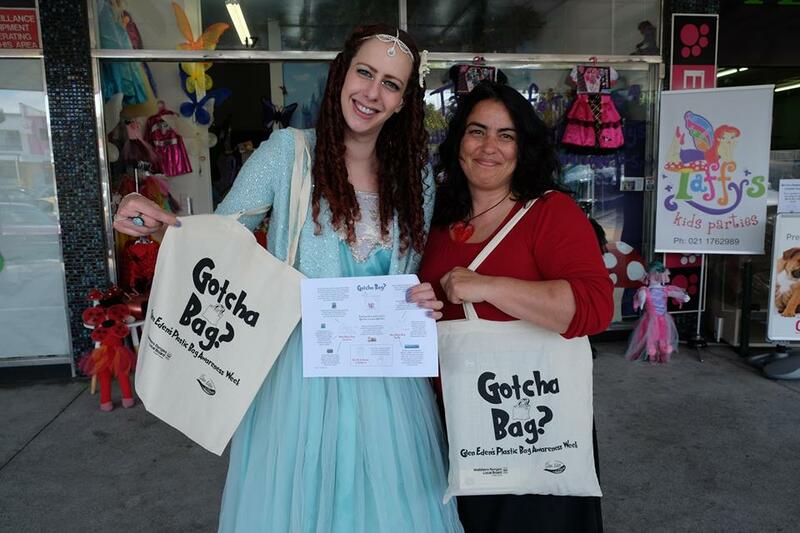 A wonderful community group that I belong to, Glen Eden Transition Town, held it’s first plastic bag awareness week last year, under the catchy slogan, ‘Gotcha Bag?’. Jennifer from the Glen Eden Business Association got all the local businesses on board (which is no mean feat, considering the inordinate number of $2 shops in the neighbourhood), we gave away reusable bags, organised sewing workshops where kids made their own bags, held free bbqs, performed street theatre and talked to each other and anyone else who would listen about the evils of the ubiquitous plastic bag. It was all pretty cool actually. And then the week was over. And I thought, “now what?” So I emailed the owner of our local Fresh Choice supermarket. After thanking Pranil (the owner) for his support of the campaign, I said I looked forward to seeing the ways in which his supermarket would tackle the issue moving forward. Pranil responded “happy to keep encouraging our customers to switch to the reusable bags”. Which was lovely, but not particularly forthcoming on details. A few weeks went by…and I decided to press for those details. The response I got made me shout with glee. Pranil said he wanted to meet and discuss options for running a trial campaign to help reduce plastic bags at his supermarket with thoughts to then extend the campaign to his other supermarkets (he has four of ’em). Yippee! I gathered a couple of co-conspirators from Glen Eden Transition Town and we had a fantastic meeting with Pranil. Yes, he was totally onboard with our ideas, yes he was happy to pay for marketing costs and yes, he would even supply pizza catering for the staff workshops we would be running. Brilliant! We all looked at each after the meeting was finished, somewhat bemused, and I exclaimed “well, that was easy!”. And, joyfully, the fruits of our labour will come together in just over a week’s time when Gotcha Bag? Fresh Choice Glen Eden kicks off. Running from 11 April – 8 May, we are holding free barbeques hosted by local celebrities such as Kerre McIvor (née Woodham) & Green MP, Denise Roche. We’ll be giving away free reusable bags (thanks Waitakere Ranges Local Board). And customers who bring their own bags will go in the draw for a hamper of Fresh Choice goodies hand-picked by yours truly (choosing products that are as zero waste as possible, of course). It’s all very exciting…and it’s just the beginning. First Fresh Choice Glen Eden…then the world! (well the supermarket world, for starters). And maybe I won’t give up on mum just yet after all. Thanks to our awesome volunteers who helped to run our free bbqs and gave away free reusable bags. Kia ora to Waitakere Ranges Local Board and EcoMatters Environment Trust for your generosity in funding our sausage sizzle and the 500 free bags we gave away. Cheers to Tonzu for donating the delicious vege sausages. Thank you to Promotional Products and Corporate Apparel by Monty’s Promotions for going above and beyond with producing our reusable bags. Huge thanks to the amazing community leader Pranil and his team at Fresh Choice Glen Eden for providing all the fantastic signage, voiceovers, prize hamper, staff support and 2000 free reusable bags. And a sincere thank you to each and everyone who supported our grassroots campaign, showed your love on facebook, stopped at our bbq, brought your reusable bags to shop at Fresh Choice and took time out to chat with us about how we can rethink our disposable habits and protect our environment for the benefit of everyone. Hey that sounds like a win! What were the workshops you held (with staff and pizza)?